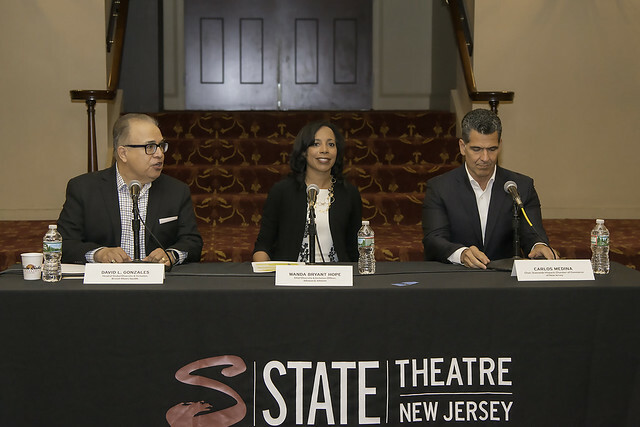 On Tuesday, July 11, 2017, State Theatre New Jersey welcomed more than 100 of our arts and business partners to our elegant Heldrich Room for networking and a panel discussion on Diversity and Inclusion in the Arts, Partnering Across Organizations, and Building a Creative Workforce. This year’s distinguished panelists were David L. Gonzales, Head of Global Diversity & Inclusion, Bristol-Myers Squibb; Wanda Bryant Hope, Chief Diversity and Inclusion Officer, Johnson & Johnson; and Carlos Medina, Chair, Statewide Hispanic Chamber of Commerce of New Jersey. The discussion was moderated by Dale G. Caldwell, author of Intelligent Influence: The 4 Steps of Highly Successful Leaders and Organizations. Interested in attending next year’s Partners’ Breakfast? Learn more about becoming a Corporate Partner and the benefits associated with supporting State Theatre New Jersey by clicking here. Listen to our Partners’ Breakfast panel discussion on “Diversity and Inclusion in the Arts, Partnering Across Organizations, and Building a Creative Workforce,” featuring David L. Gonzales (Head of Global Diversity & Inclusion, Bristol-Myers Squibb), Wanda Bryant Hope (Chief Diversity & Inclusion Officer, Johnson & Johnson), and Carlos Medina (Chair, Statewide Hispanic Chamber of Commerce of New Jersey), moderated by Dale G. Caldwell (author of Intelligent Influence: The 4 Steps of Highly Successful Leaders and Organizations).